Whereas here in Montreal, street food was banned since the last generation, it’s not unusual to see food vendors populate sidewalks in Toronto. 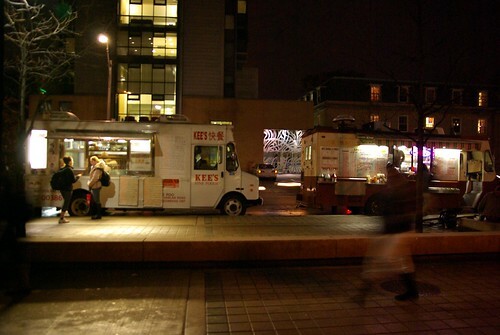 Although generally you find hot dog stands – I was told that the city by-law regarding street food only allowed one kind: sausage + fries – we have bumped into these trucks selling Chinese food parked on St. George, a street that crosses the University of Toronto campus. Specifically, it would seem that they are in business during the day, but not during weekend, to my dismay, as I wanted to treat myself to some Chinese food made in a van in less than a minute (I settled for pizza on Spadina). 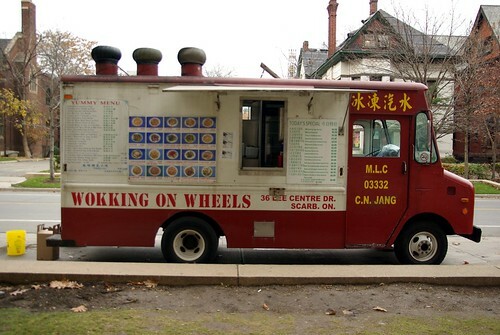 According to a friend of mine who went to U of T, the former, Wokking On Wheels, is a true institution that has fed more than one student running between library and exam room.